Final Text: Deal Special damage to target enemy and inflict Ability Block for 1 turn. This attack deals 10% more damage and has +10% Critical Chance for each active Sith ally. Final Text: Deal Special damage to target enemy and Shock them for 3 turns. If the target already had Shock, deal bonus Special damage to all other enemies. This bonus damage can't be countered. This attack can't be evaded. Final Text: Stun target enemy for 1 turn with an 80% chance to Stun another random enemy (can't be evaded). When each of these Stuns expires, inflict Offense Down, Defense Down, Evasion Down, Speed Down, Expose and Stagger for 2 turns. These effects can't be resisted. 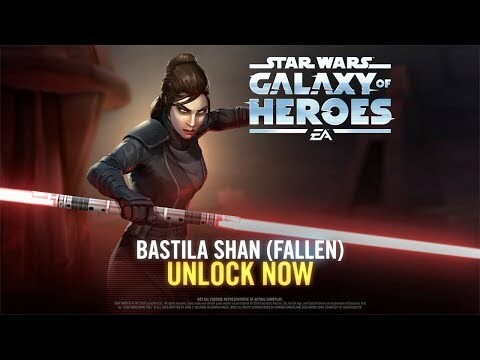 Final Text: At the start of Bastila's turn, all enemies lose 3% Turn Meter (doubled against non-Jedi and non-Sith) and are inflicted with Corrupted Battle Meditation for 1 turn. Then she recovers 1% Protection for each debuff on enemies. Final Text: (ZETA) Bastila and the character in the leader slot have +50% Defense and Tenacity and gain Foresight for 1 turn at the start of battle. If Bastila's leader is Sith, whenever an enemy is inflicted with Deathmark, Marked or Shock, they both gain 5% Offense (stacking up to 100%) for the rest of battle. This ability does not apply to characters in the ally slot. Oh geez. This will be fun. How many will we see in arena tomorrow at 4 stars? Now that is the question. I’m just glad she isn’t riding a surfboard anymore. When did she fall to the Dark Side? Hope for Darth Revan and Darth Malak. Looks like a hard counter to CLS lead rebels. Malak corrupts her just before the final planet and Star Forge levels. So they made her the opposite of her Light side self almost, interesting. Is this only because this happened in cannon? (Since you can make your characters be light or dark as a gameplay feature in kotor2). Essentially, you need to resist the stuns, if you do she doesn't do much to your team. She'll need a lot of potency to work against bast teams and will need someone to remove tenacity up. I feel bad for any team that's not jedi or sith though. She make it like the arena should just be Jedi and Sith teams, lol. I like her reverse-bastilla kit. Its a good touch. Can stun be resisted from Fear? You can be light or dark in kotor1 too, but you cant play Bastila, she falls to the dark side no matter your choices. Thats canon. However, your choices can make a difference in what happens to her afterwards. 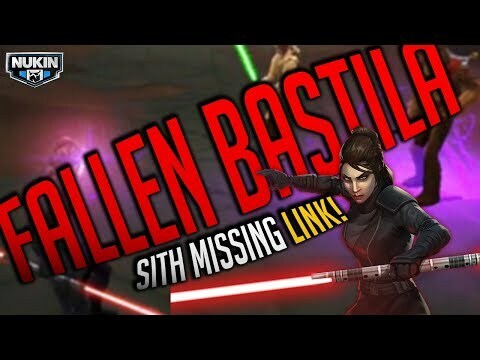 Either bring her back the light as a savior..
Or make her your sith apprentice and rule the galaxy together! I'm glad that came through! That's exactly the experience I tried to capture with her Sith Apprentice ability. By the way, I'm Sven - I joined CG as a game designer a few months ago, so you'll be seeing more of me in the future. Glad i run scoundrels with l3. I’m officially in love now. Great character, great artwork, love the gameplay concept. Help me out on synergies though, please. I get palp and dooku, they do shock. Kinda get nihilus, he’s at least a leader (but then again, not only sith leader). But don’t see sion synergy at all. Hope to see you around more often. Not just for answering Q&A on kits but maybe provide some insight into some decisions or just random posts here and there! Oh man, glad to see you, but I hope you have a thick skin. Anything that isn't 100% absolutely perfect tends to get pooped on around here. She gets a bonus on her basic for every Sith ally, so I feel like they just stuck Sion in there because he's key to a lot of Sith teams. She's alright. At this moment, Her Sith Apprentice unique is all she's good for, stars doesn't matter. Once Traya survives the initial assault by Jedi Knight Revan by A.I. its an easy win. I like how she works with Jedi Knight Revan in a non-leader slot (stacking offense) or in leader slot (OR tag). Its seems Darth Revan will also include Marked in his kit (Canderous and Bastila are more effective that way) and the reworked HK should inflict Deathmark with a synergy against Deathmarked, Marked, ? toons. Its already turning out to be a powerful team combination. Although it eliminates a degree of luck or RNG; it trivialized stats/mods/abilities. No more marquees for the rest of the year they said.